Dec. 4, 2018 – Rayonier Advanced Materials (A.M.) is investing to update the primary breakdown line at its La Sarre, Que. plant. 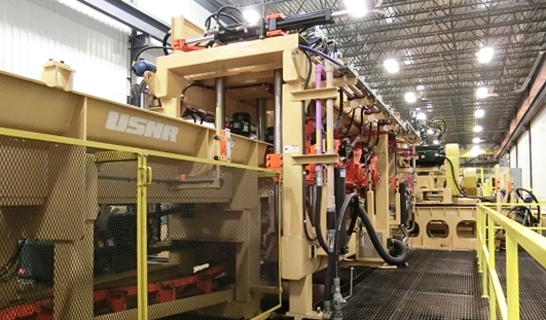 The company is installing a new small log line from USNR that will feature a knuckle turner and extended length infeed with slew, skew and tilt capabilities, PGLR log rotation monitoring and correction system, canter, sideboard profiler, quad arbor sawbox and VSS vertical shape sawing gang system. The stud mill operation processes Eastern SPF logs from three to 17 inches in diameter, with the line’s maximum operating speed at 600 fpm. The La Sarre mill will also install a sawmill multi-track fence as it re-tools to improve its process. Close on the heels of the investment in the La Sarre operation, Rayonier A.M. ordered a new VSS vertical shape sawing gang system from USNR for its mill at Bearn, Que., as well as a planer mill multi-track fence for that location. The Bearn mill produces random length lumber. In 2017, Rayonier A.M., based in Jacksonville, Fla., acquired all of Tembec’s holdings in Canada, the U.S. and France. The La Sarre and Bearn mills are among those holdings.